Here is my video on the 2012 Treat Yourself kit by Tarte. This kit is still available through QVC. If you have already received your package, what do you think of this collection? Although I spoke about it in my last video I wanted to share pictures of my NOTD (nail of the day). 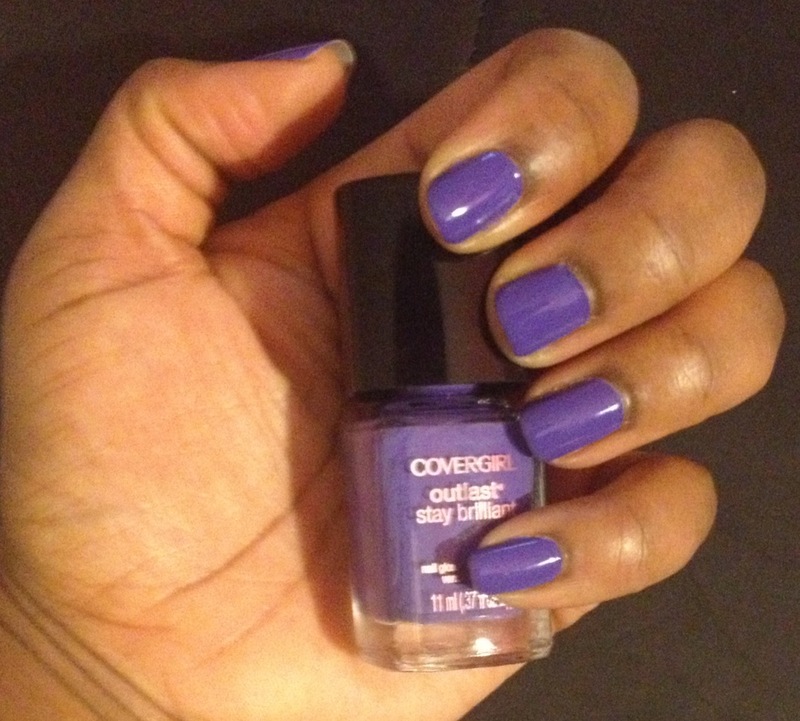 I am wearing vio-last, one of the colors from the new Cover Girl Outlast Stay Brilliant nail polish collection. The formula used for these polishes are thick but not to the point of being goopy. One coat can certainly do the trick but I always use two for good measure. These $8.00 (+) polishes which dry with a shiny top coat are worth every penny. If Cover Girl offered a wider selection of colors they could easily usurp the drugstore polish throne. I should note that in the pictures below I did add an additional top coat from the CND brand. However, if you watch my last video you will see the polish in it's natural state without an additional top coat. Here is the polish with the camera flash off. By now you know that I like to purchase products, hence the name of my blog. So when Black Friday and Cyber Monday roll around, the little hairs on the nape of my neck uncoil and stand at attention. I look forward to restocking my now barren shelves and I anticipate the arrival of each package. So when companies decide to play musical chairs with their sales pricing it sours the shopping experience. Some companies have bounced around different sales prices between Black Friday and Cyber Monday and consumers only hope that they click the "pay now" button when the price is truly at its lowest mark. For example, when Elf publicized their buy one get one half off Black Friday sale, I like many others jumped at the chance to try some of their new products, only to have a 50% off site wide sale appear on Monday. Of course I expected companies to have a Cyber Monday sale, but when that sale is far superior to the sale that ended a day prior, it makes me feel as if they only want to soak up as much money as possible. This is the time of year when many companies have an opportunity to enter that coveted financial black zone leaving behind the prior months when they were financially in the red so I understand the need to make money, but at what cost? Elf wasn't alone in dampening my online shopping tryst, I was also angered by the companies that offered no sale at all, but instead offered free shipping if you spend $200.00. Or better yet, the companies that really had no sale at all but offered a free product, one which probably sells poorly anyway.sigh. For the love of all that is Black Friday & Cyber Monday madness why can't companies provide us with the best prices possible during this annual shopping fiesta? To the companies out there if you are worried that you will lose money, you won't. If you offer your products with reasonable discounts we will come in droves, to point, click and "PAY NOW". How was your Black Friday/Cyber Monday experience? Here are my two latest videos.- Enjoy. Can you believe it, it's already time for the Black Friday post. I will continue to update the list below as more information becomes available. I should also note that youtuber TastiredBone has a Black Friday list on her blog which already includes MANY Black Friday Sales. Please feel free to list sales that may not be on these lists in the comment section below. Sharing is caring :-). Miss Jessies- buy one get one free from Nov. 18th- Dec. 15th. I would also suggest checking your local stores that sell the MJ products because some may also honor the BOGO sale in store. Curl Junkie- Starting Nov- 22 at 5pm - Nov 23 you can get 25% off all orders totaling $50 or more. Use the code THANKS2012. This sale excludes kits and samples. Brown Butter Beauty- Get 25% off Nov. 23-25th use the code BLACKFRIDAY. Oyin Handmade- The entire store will be discounted 20% off all items NO CODE required. Free domestic shipping on orders $60 or more use the code thisisblackfriday and for a $10 discount on international shipping use the code BLFI (the last letter is an I in case you were wondering). I'm not sure if you want to consider this next one a sale or not but Jane Iredale will give you a triple eye shadow if you use the code "THANKS" at checkout from Nov. 19th-25th. HOWEVER you must spend $125.00. OCC Makeup- Nov. 23-26 If you spend $25 or more you will get a free Triptych metallic gold lip tar for free. WHILE SUPPLIES LAST. for CYBER MONDAY (directly from the OCC email) "Since Black Friday, any and all purchases over $25.00 USD receive a free Triptych Lip Tar from our very first collection of Metallic Lip Tars! On Monday, all purchases over $75.00 USD* can pick any additional Lip Tar, also completely free of charge, in addition to your complimentary Triptych Lip Tar!" Black Up Cosmetics they are still doing their friends and family sale of 20% off and free shipping on any order of $90 or more. Elf Cosmetics- Nov 22- 23 buy one get one 50% off You must have a $30 minimum- use the code BLKFRI ON CYBER MONDAY- use the code 50WIDE for 50% off everything. Julep Nov 23-25 you will get a free gift with every $20 you spend. (I already made my purchase so I can tell you the gifst range from headbands, to cup to more nail polish). Shipping is free no code necessary. The Body Shop - 50% off site wide and free shipping if you spend $30 or more. Bath and Body Works- 25% off your entire online order use the code CYBER2012. Aerosoles- save 25% off your entire order, no code necessary. DSW Now through Nov. 27th save $15 off $74, $30 off $149.00 and save $50.00 off $199.00. Mac use the code CYBER and get overnight shipping free for Cyber Monday. Butter London- For cyber Monday select colors on sale for $10.00. Carol's Daughter- Cyber Monday save 15% off any order, 20% off orders of $50 or more and 25% off orders of $75 or more. Pooka Pure and SImple 2 for 1 on whipped creams and butters. $3.00 shipping for all purchases. Ann Taylor- Nov. 20th- Nov 23 get 40% off full priced items use the code THANKS For Cyber monday use the code MONDAY to get 40% Off. New York & Company- Nov. 23rd until 2PM online get 40-70% off items. No shipping charges on any online order (no minimum required). Spiegel Black Friday weekend Buy one get one 50 % off while supplies last. JJill in store and online use the code thanks for 25% off your entire order. Barnes & Noble - Nov. 23-25th 30% off a single item including sales items use the code T9P3E3W (select items up to 50% off and in store only you can get a nook for $59.00). 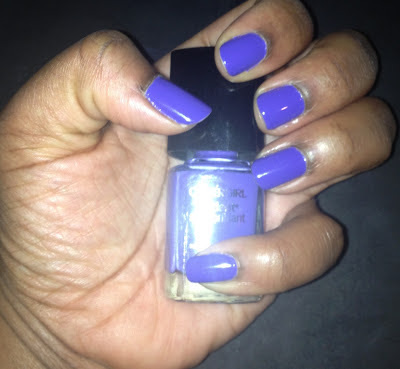 Here is my nail of the week color. 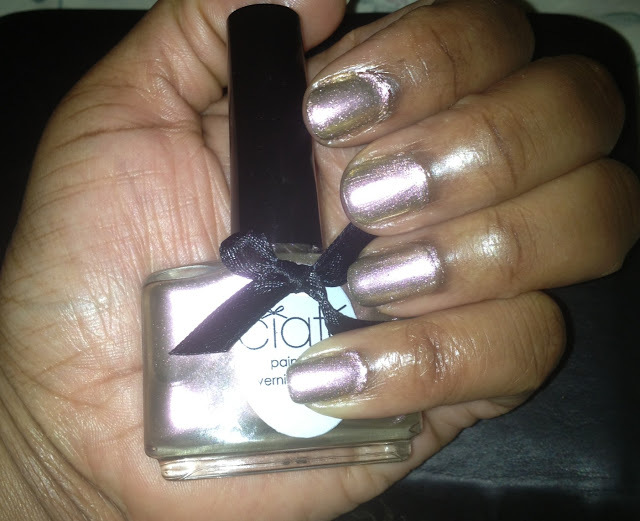 I'm wearing Spending Spree #108, by Ciate. This color looks like an iridescent pink/ gold/silver color. The color didn't translate so well in my picture but hopefully you can see the gold color outlining my nails and the pinkish/ silver color in the center. 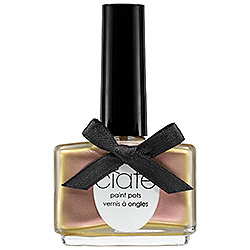 This polish costs $15.00 and it is available at Sephora (online). Now here is my latest WNTW video. I will have my Black Friday list up very soon. If you are a Sephora VIB member, please remember that the 20% off sale starts Nov. 8th and ends Nov 12th. Use the code Celebrate if you are shopping online. It really annoys me that they only give a 20% discount, at least once during the year it should be 30 or dare I say 40 % off. Butter London has extended their 30% off sale until Nov. 11th. Please use the code FRIENDS12 at checkout. Jurlique is also offering a discount, 25% to be exact. Use the code FFEVENT at checkout. Do you have and special items on your shopping wish list? If you watch the news you will be told, as I am , that things are getting back to normal during this post- Sandy period. Clearly, a week is not enough time to make such a declaration. The simple fact that we still can't find a gas station that actually has GAS is an indication that things are not back to normal. I walked to the store today, for those who know me personally, they are now picking their chins up off the ground. Apparently some trains and buses are running on a limited schedule. My job will reopen on Monday.....ok and how am I supposed to get there??? Well we shall see, but the last I checked a tunnel that I go through to get to work was filled with 12 feet of water. In the end my family members and friends are alive so there is really not much to complain about. The NYC marathon has just been cancelled and some people are fuming because this decision should have been made days ago. While powerful generators and tractor trailers filled with food await runners who will no longer run the race, many wonder why those supplies were not dispatched sooner to those in need. That's actually not why I decided to write this blog, but I just had to vent. I read an article over at Clutch Magazine (love this online mag) about checking people and it made me think immediately of an episode of Don't Sleep. Nearly two weeks ago TJ Holmes had his first female dominated panel, which featured Vivica Fox and Crystal Wright. You can watch that episode here. If you were able to catch the episode, you witnessed the fiery retorts between the two women. Although some want to fling the words ghetto and bougie at Vivica and Crystal respectively, I think they both behaved in an unprofessional and childish manner. Having seen Vivica in the past converse with people who share her opinion, I know that hand clapping, wide sweeping hand movements and in your face hand gestures, are well within her gesticulatory repertoire. This is not to excuse her behavior because common sense dictates that when you disagree with someone if you include hair flinging, snapping fingers and similar movements, the person with whom you are conversing may find you to be disrespectful. Now Crystal is certainly not off the hook because her condescending comments and childish mimicry didn't go unnoticed. I was saddened that TJ's first show with two female panelists was tainted with women who couldn't control their emotions. Honestly I think both women were intimidated by the other for different reasons, but that's just me.... I would have preferred a pairing of Crystal and Issa Rae, because things would have played out in a totally different manner. But, I digress - my point is if you have a difference of opinion with your coworkers, fellow panelists or anyone else, and you feel that you have been disrespected, there is a way to "check them" without being rude. I agree with some of the commenters over at Clutch, there are some remarks that you can let slide under the rug, but there are times when you just want to put a person in their place. Perhaps its our pride tapping us on the shoulder and nudging us to think of a quip that can singlehandedly turn our verbal opponent's self esteem into minced meat, but whatever it is that motivated us to respond, I think it boils down to wanting them to feel what they made us feel. Unless their behavior or comment is overtly rude, perhaps we should consider why their remark cut us so deeply, maybe it's time for a little self- examination. So I ask you, how do you handle people with the three personality types described in the Clutch magazine article? If you didn't get a chance to read the article it focused on those who are aggressive, passive- aggressive and know -it-alls.